We received some much needed rain this weekend. There was a slow rain/drizzle all day Saturday and then a little sun Sunday afternoon. 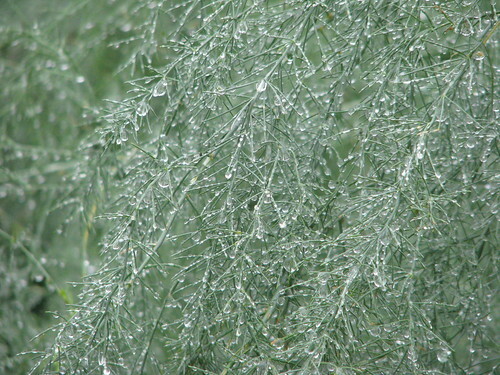 Here is a look at the wet garden on Sunday morning. 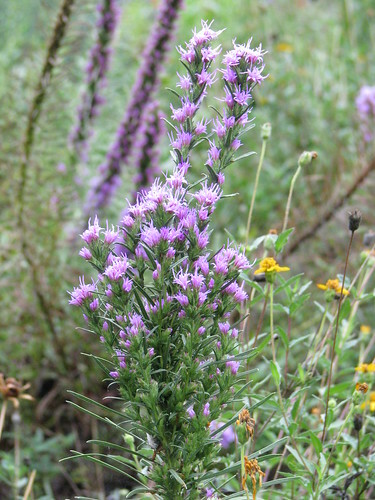 Liatris of a yet to be determined variety fill the prairie. 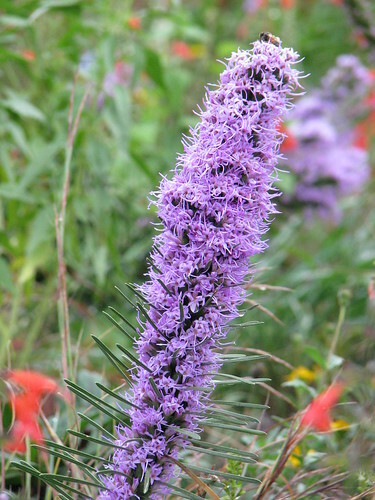 Although all of the Liatris plants are seedlings from two plants in the garden, they produce their flowers on a variety of different shaped stalks. 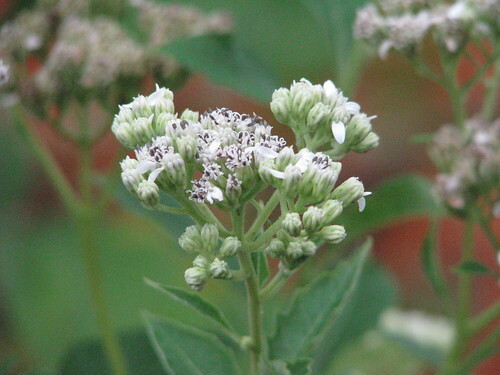 Thick clustering of flowers on a single stalk with leaves half way up the flowering portion. Narrow clustering of flowers with long leaves all the way up the flower stalk. Flowers clustered on the end of the stalk. 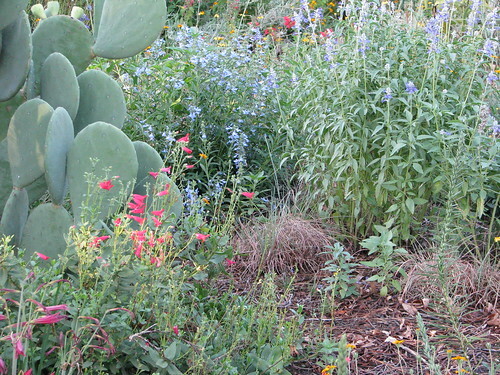 Next spring's bluebonnets are sprouting throughout the garden and pathways. 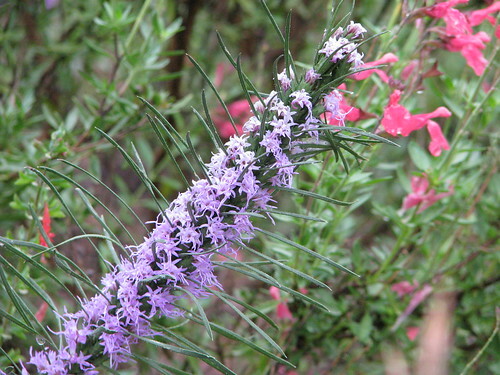 The Fall season starts today and there are a few native plant sales that I wanted to share. The first two sales are on the western side of the Dallas-Fort Worth Metroplex. This sale includes a nice selection of 62 varieties of native perennials, annuals, vines, groundcovers, shrubs, trees and grasses. I have over half of these plants growing in my garden now and several came from this sale. 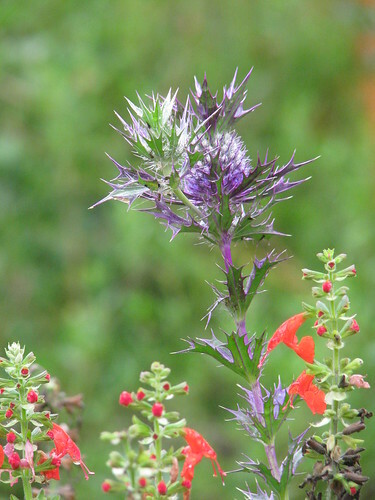 For more information about the Wildscape, the plant sale and a list of available plants, click here. 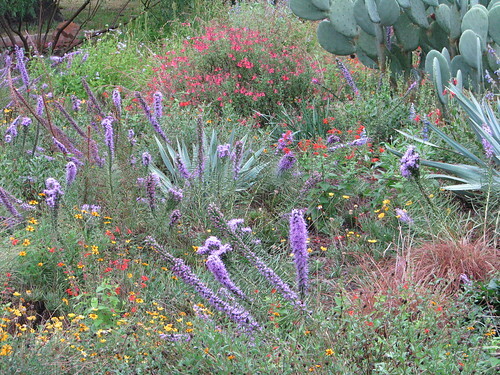 The Fort Worth Botanic Garden holds their annual Fall Plant Sale on Saturday, October 13 from 9:00 AM to 2:00 PM. The Fall and Spring sales at the FWBG are some of my favorite plant sales. 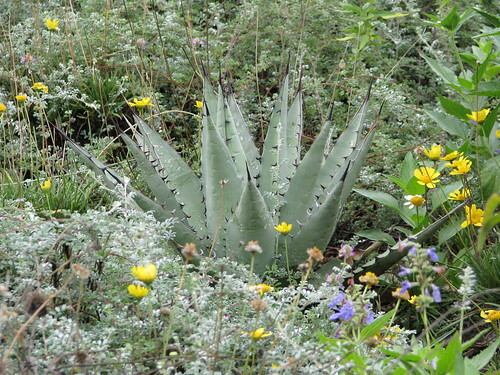 Native and adapted plants are available from several vendors. 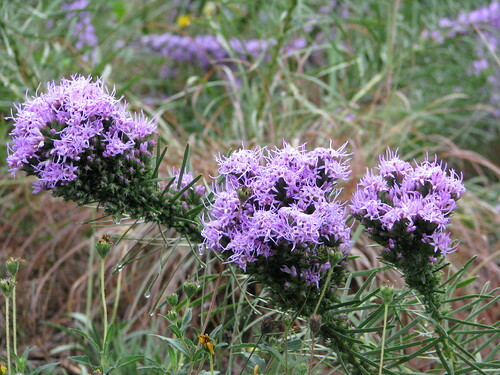 The North Central Chapter of the Native Plant Society of Texas will have several great varieties of native plants available for sale and member volunteers are always available to answer questions and help you with your selections. For more information on the FWBG website, click here. 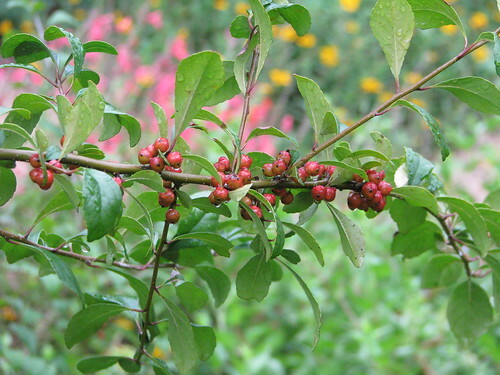 For a list of native plants that the North Central Chapter will have available click here. 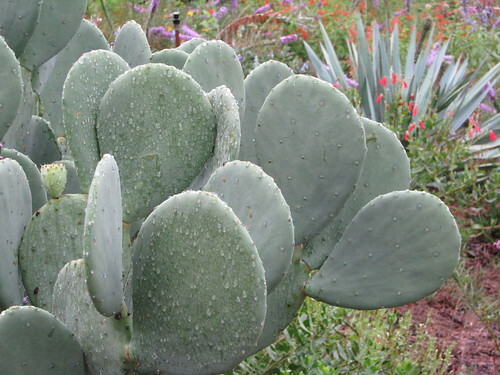 On the eastern side of the Metroplex, the Texas Discovery Gardens at Fair Park in Dallas has their Fall Plant Sale on Saturday, November 10 from 11:00 AM to 3:00 PM with a member's preview the day before from 4:00 PM to 7:00 PM. 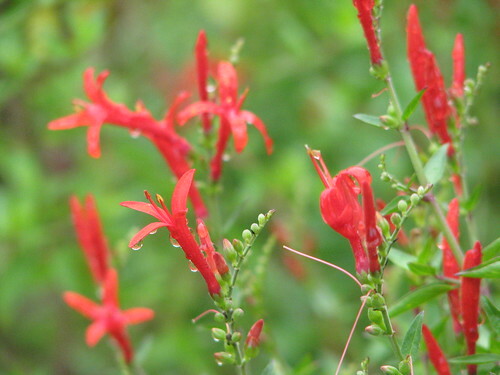 This sale usually has a variety of native and adapted perennials, shrubs and trees. 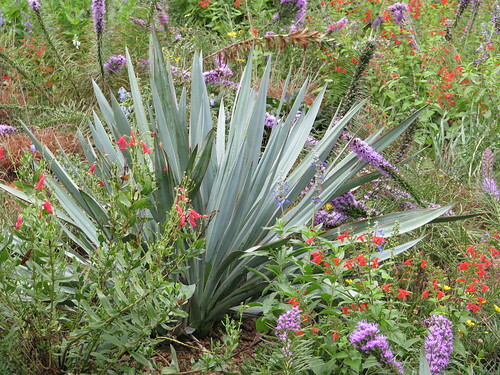 Many of the plants in this sale attract butterflies. There is no additional information is available about this sale at this time. 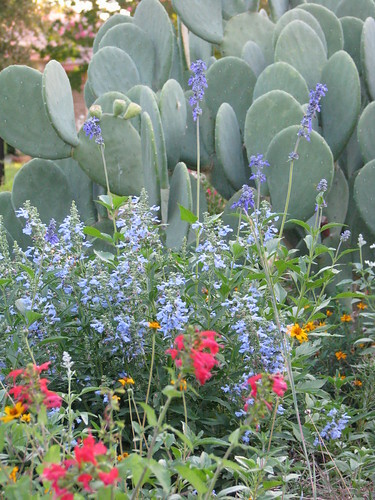 Check back with the Texas Discovery Gardens website for plant lists and additional information. 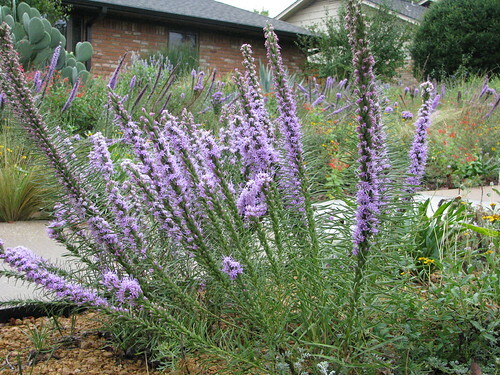 Take advantage of these sales and get some native plants! Fall is a great time for planting because new plants will have several moist, cool months to establish a strong root system before the heat of Summer returns. I did not have many posts this summer because I was busy with various projects and because my garden looked pretty sad. In fact, about a month ago, I started working on a post about the condition of the garden and I was planning to temporarily change the header of the blog to read Pathetic Prairie Garden. But then, out of nowhere, near the end of August, temperatures dropped from the plus 100s to the 80s and it rained. That change in weather, albeit temporary, was enough to bring the garden back to life and change my mood about the garden. 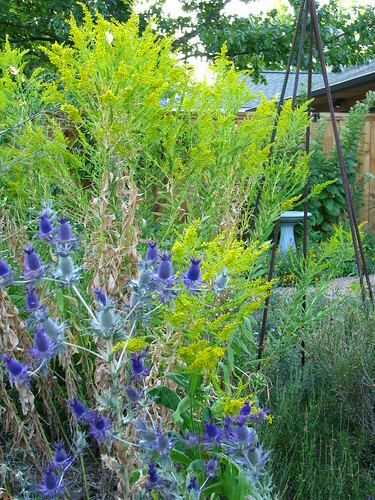 First I will share how the garden looked once it came into bloom again and then I will share some reasons that it looked so pathetic before the rain and cooler temperatures. Beebrush, Aloysia gratissima, bursts into bloom with tiny white flowers after a rain (or irrigation). The plant was covered in bees, even after area wide pesticide spraying for mosquitoes. 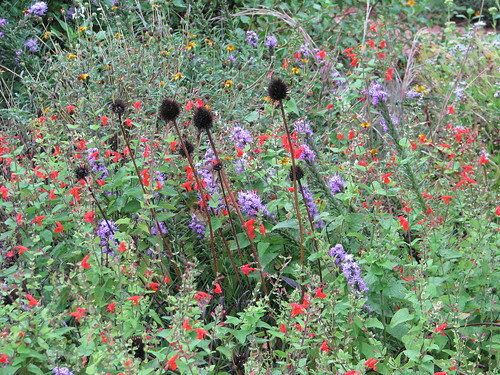 Red and purple Salvia greggii are at the foot of the beebrush. The orange flower is Zexmenia, Wedelia texana. More Salvia greggii flowers coordinate with the purple berries of American beautyberry, Callicarpa americana. 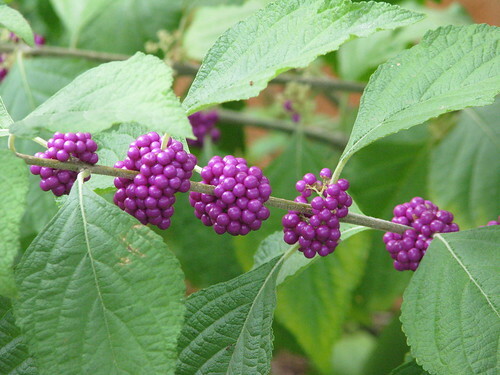 Here is a close up of the American Beautyberry fruit. The berries don't last long after they turn purple because they are a favorite snack for mockingbirds. I see at least five kinds of flowers in this photo. 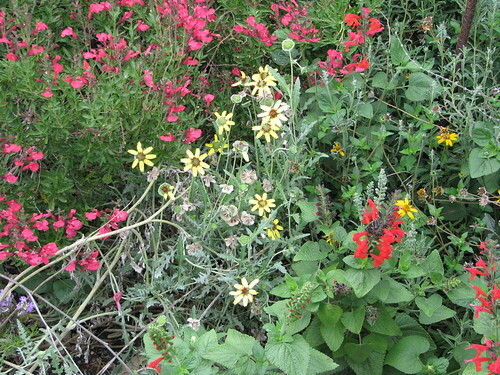 Salvia greggi, Scarlet Sage, Salvia cocciniea, Zexmenia, Wedelia texana, Chocolate Daisy, Berlandiera lyrata, and Prairie Verbena, Glandularia bipinnatifida. 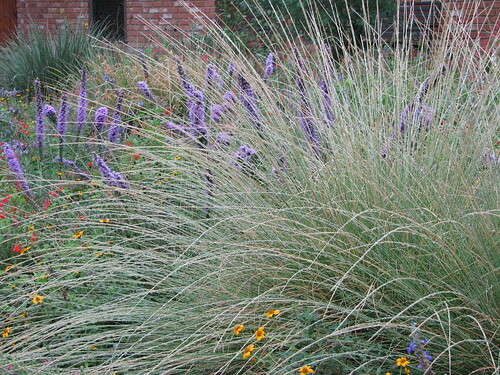 The Pine Muhly grass, Muhlenbergia dubia, is in full spiky flower. 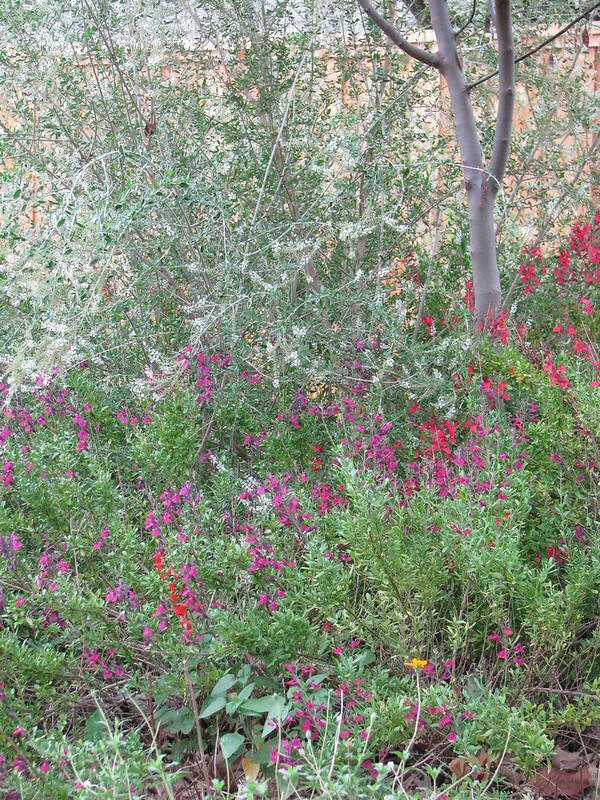 More Scarlet Sage surround the Pine Muhly. 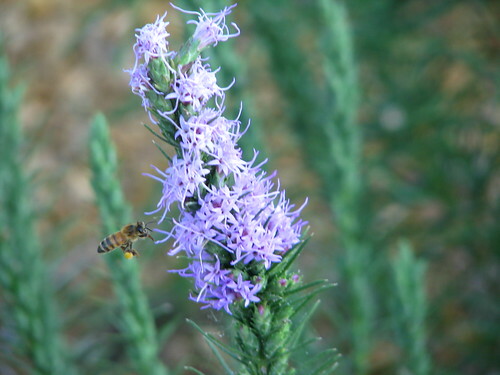 The flower spikes of Liatris are all around and are just beginning to bloom. Just a slight shift to the left brings a few more flowers into view. 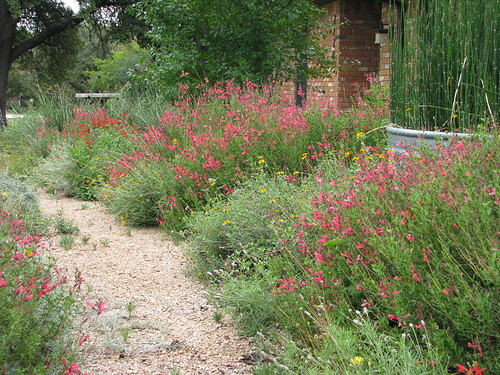 The pathway running across the front yard prairie is lined by Salvia greggi, Zexmenia, and other flowers. Looks like I need to weed flowers out of the pathway. 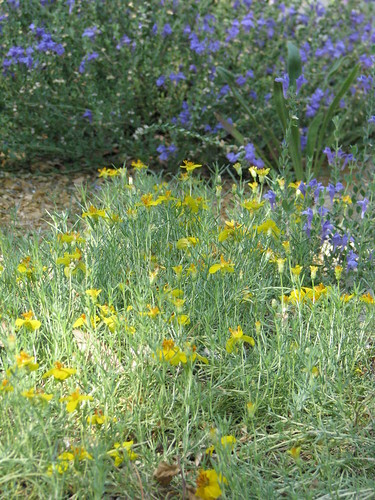 Yellow Zinnia, Zinnia grandiflora, and Purple Skullcap, Scutellaria wrightii, grow in a couple of inches of decomposed granite in the parkway with minimal supplemental water. 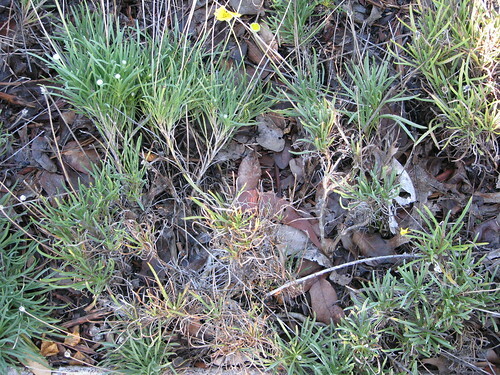 Yellow Zinnia is a slow spreading native groundcover. 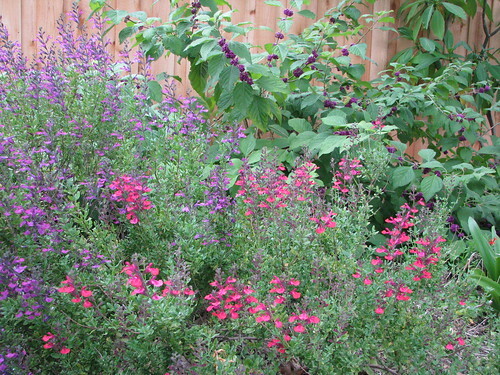 Three salvias: Scarlet Sage in front, sky-blue Pitcher Sage, Salvia azurea 'grandiflora', in the middle and purple Mealycup Sage, Salvia farinacea, in back. 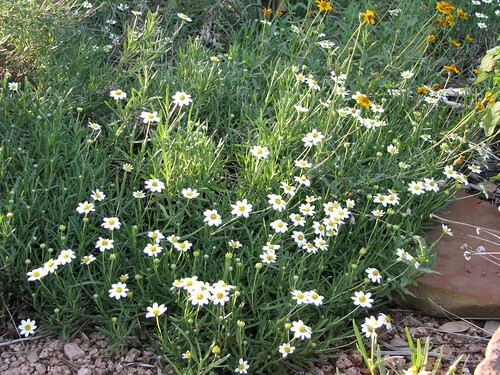 The white flowers of Blackfoot Daisy, Melampodium leucanthum, glow (glare) in the morning sun. 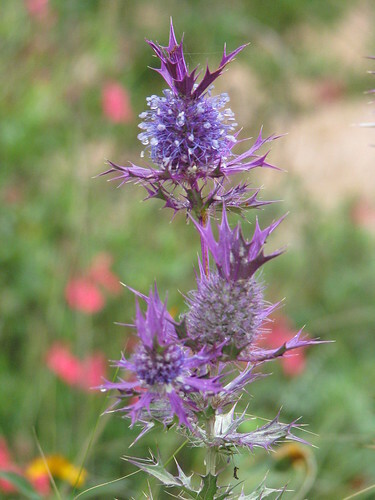 The purple flowers of the spiny Eryngo, Eryngium leavenworthii, bloom in front of Goldenrod. The Goldenrod appeared on its own in the backyard prairie a couple of years ago. For the first couple of years, it was around two feet tall. This year it is over four feet tall and spreading by runners. Even without flowers, the plants are a nice vertical accent in the garden. The looked nice until the lower leaves started turning brown. Goldenrod is known for its ability to spread. I hope I have not allowed a monster to take root. This was the second summer for my prairie. 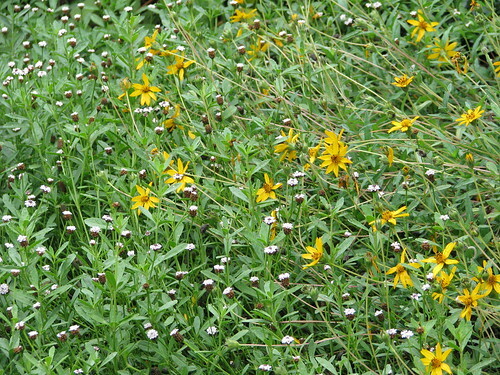 Four Nerve Daisy flowers filled the prairie and the Little Bluestem grass was tall and lush in the middle of July. 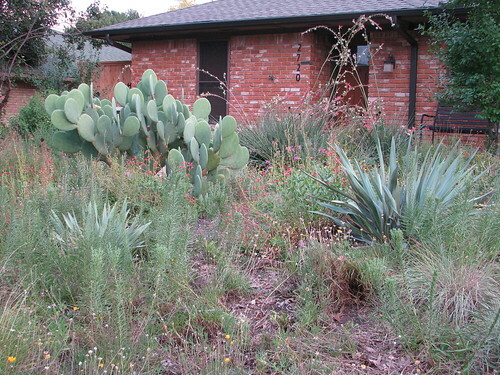 In this photo from 07-09-12, the cactus and yuccas have clearly grown, but where are the flowers and the Little Bluestem? This is the reason I felt that I had a Pathetic Prairie Garden. 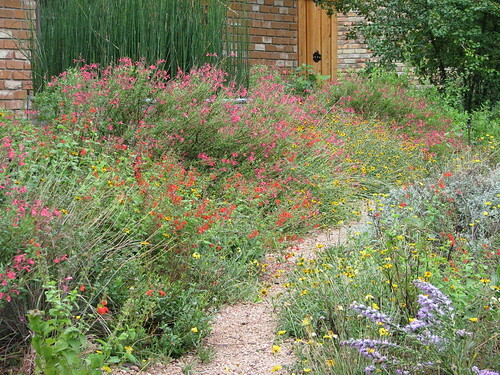 Without the flowers and the grass, it looks more like a patch of weeds than a prairie garden. 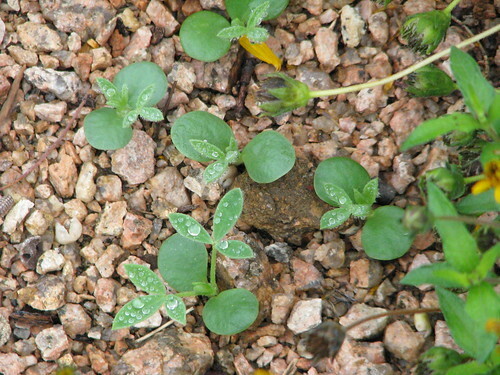 A couple of sad little clumps of Little Bluestem are visible at the base of the salvias. 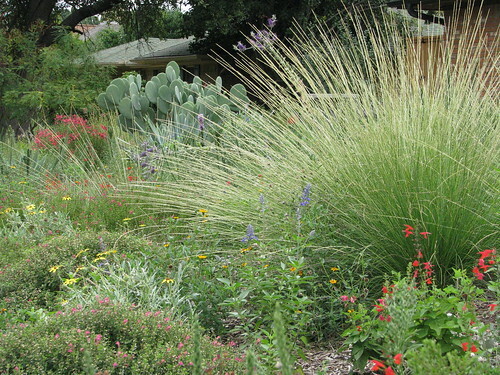 I have never had long term success with Little Bluestem. They always die out after a few years. 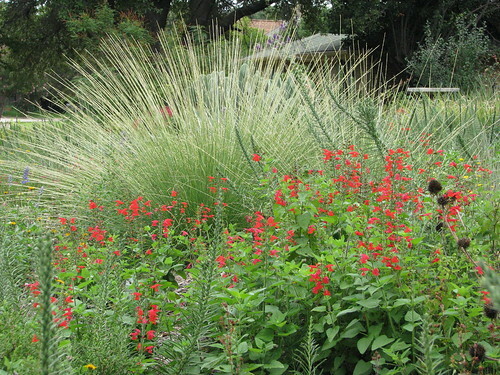 Several internet references indicate that Little Bluestem requires periodic burning to thrive. I have tried burning a few plants with a blow torch in one hand and a water hose in the other. It seemed to help, but burning the entire prairie is not practical and probably not legal in a suburban neighborhood. I have been cutting back on water and eliminated fertilizer in an effort to have a more sustainable garden. Another factor that will ultimately lead to the eradication of Little Bluestem in my prairie is that Little Bluestem is the first grass I have grown that has not spread by seed or rhizomes. There are no new plants to replace the dying plants. Compare this photo from 03-31-12 to the one from 07-09-12 two photos above. What happened between March and July? Four Nerve Daisies filled the prairie in March after growing and blooming throughout the winter months because the temperatures were so warm. It was not long after this photo was taken that I started noticing that the Four Nerve Daisy plants were turning brown and crispy. These are milkweed bugs and they are EVERYWHERE this year. I never noticed them in my garden before last year and this year there was a population explosion. I don't have enough milkweed plants to support the number of milkweed bugs that filled the garden this year, so they must be feeding on something else. Although I could not find any references that said milkweed bugs will attack plants besides milkweed, I suspect they may have contributed to the death of my Four Nerve Daisies because I found young milkweed bugs around the base of several dying plants. So what's next? 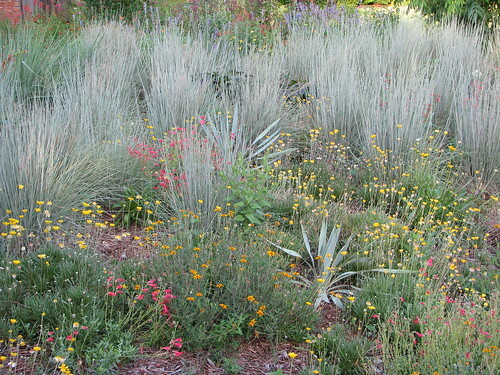 I am thinking of ways to organize and add structure to the garden as the Little Bluestem declines. 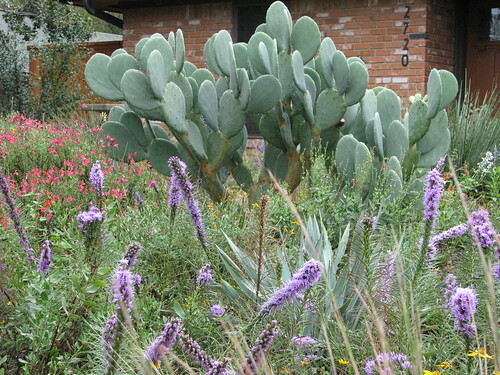 Perhaps more pathways and more succulents. 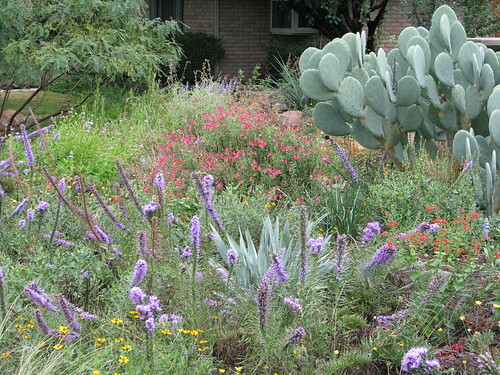 The garden's appearance during the summer months definitely needs help. 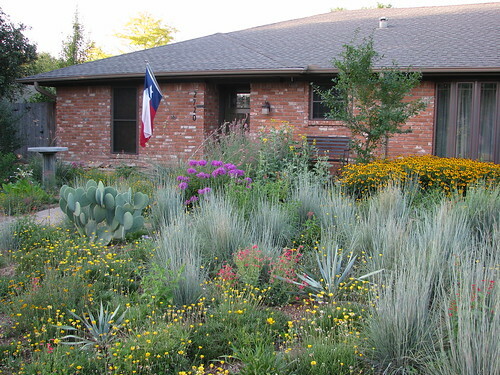 I also think that Pine Muhly and, perhaps, Mexican Feather Grass will be the dominant grasses of the prairie once the Little Bluestem is gone. The garden is ever changing. I hope I can come up with a plan that will keep the garden attractive most of the year and allow me a little time to relax and enjoy it.